Amblyopia is a condition in which the brain uses only one eye instead of both. Also known as ‘lazy eye’, this condition only develops in children and may cause vision loss and other conditions, such as crossed eyes. Usually, a child will develop amblyopia no later than age 6, though it may appear much sooner than that. Your optometrist can diagnose amblyopia during a comprehensive eye exam. A child with ‘lazy eye’ will need to wear prescription lenses and may need vision therapy to help treat the condition. Astigmatism occurs when the eye’s natural lens becomes misshapen. There can be varying degrees of corneal astigmatism, which often occurs in people with other vision impairments, such as myopia and hyperopia. Astigmatism is very common, causing blurry or distorted vision, as well as the potential for headaches or eye strain. An optometrist can diagnose astigmatism during a standard eye exam and prescribe treatment, such as glasses or contacts, to help treat it. Emmetropia is the term used to describe an eye with normal vision strength, curvature and eyeball length. People with emmetropia require no corrective lenses, as images come into natural focus on the retina. Hyperopia is a refractive error that causes farsightedness and blurred vision when looking at objects up close. Approximately 1 in 2 people has some degree of hyperopia, which may also cause headaches and eyestrain. Hyperopia is typically genetic and usually develops in childhood. The condition is easily diagnosed during a comprehensive eye exam and treated with glasses or contacts. Myopia is a refractive error that causes nearsightedness and blurred vision when looking at a distance. The condition is very common, affecting approximately 30 percent of the total U.S. population. The condition usually develops in childhood and gradually worsens throughout adolescence. Myopia is easily diagnosed with a comprehensive eye exam and corrected with various treatments, including glasses, contact lenses or refractive surgery. Presbyopia is a refractive error in which the eye is no longer capable of focusing correctly. It is primarily age-related and occurs in all people – usually sometime after age 40. Presbyopia is a not a disease though it can make reading and viewing objects up close much more difficult. A comprehensive eye exam can evaluate visual acuity and diagnose presbyopia. 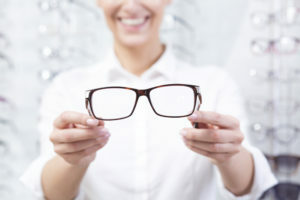 Often, patients only require reading glasses to manage the problem, though prescription bifocals, trifocals or contact lenses may be necessary for some people. 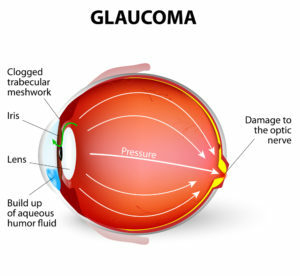 Glaucoma, the leading cause of blindness in the United States, is a term used to refer to a group of eye diseases that ultimately cause damage to the optic nerve. Unfortunately, there is no cure for glaucoma; but there are treatments available to help manage the condition and prevent vision loss. People with glaucoma often experience slow and gradual vision loss that is so subtle, it is virtually undetectable until it reaches advanced stages. Glaucoma often presents no other symptoms than vision loss, which is why it is important to visit an eye doctor periodically for comprehensive eye exams. As the disease progresses, it can cause eye pain and nausea, as well as total vision loss. Keratoconus is a condition of the eye in which the cornea becomes thin and misshapen. 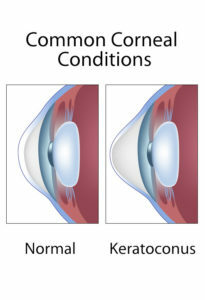 Whereas a normal cornea is round, a cornea affected by keratoconus will begin to bulge and take on a cone-like shape. Keratoconus is believed to be linked to a congenital problem. 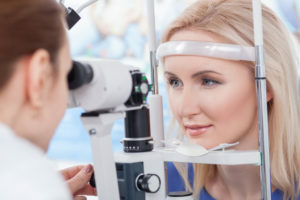 Though it may take many years before the condition starts to affect sight, the tendency to develop the disease is believed to be present at birth. Researchers are unsure of the exact cause of keratoconus though it seems to be associated with a collagen defect. Macular degeneration is a disease in which the macula weakens, resulting in a loss of central vision. The condition, also known as age-related macular degeneration (AMD), can cause blurring and even partial vision loss. There are two types of macular degeneration – wet and dry. Most people with the disease have the latter version, which is caused solely by an aging macula. However, some people have wet macular degeneration, which occurs when abnormal blood vessels grow inside the macula. 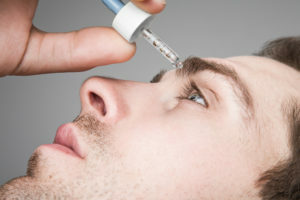 The wet version can lead to permanent scarring and loss of central vision.